As soon as the weather permits I like to be outside, the air here at Casa Santicchio is very pleasant, there are no factories, nor intensive farms, and there is the forest with its nature trails where I go walking with my dog. But what can one do when it rains and it’s not easy to be outside? 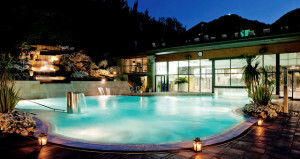 I think for a while and decide to go to the Spa at Bagno di Romagna. It’s only 30 km away, and even if it takes 40 minutes, the Mandrioli mountain pass with its ravines has its own charm, and in less than no time I’m there. The spa is very nice, the water has a temperature of about 45 degrees. It was originally rainwater falling in the area near Mount Comero, entering the subsoil and penetrating down to huge depths, becoming enriched with minerals and then emerging, after a long journey, in Bagno di Romagna at this temperature. This water is bicarbonate-alkaline and sulphurous, with many healing properties, but in truth I come here simply because I find it delightful to soak in the hot water. All my good intentions to stay in the thermal water only for short periods at a time, vanish when we emerge ourselves in the hot water, and we pass from the indoor pool to the outdoor one where a breathtaking waterfall awaits us. The water that falls from the waterfall is very hot and I just want to stay here forever. With a lot of persuasion I get my kids out of the water and now we are hungry, very hungry. We go to Bagno di Romagna where, in the old part of town and at very little expense, we eat the best piadina of the area.